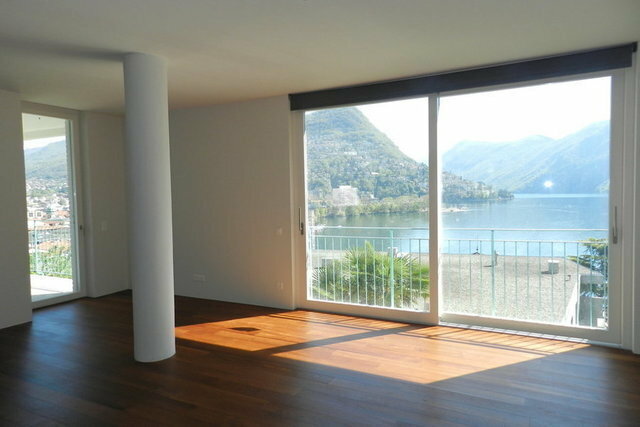 Casa Solatia is set on a hill in Lugano in a quiet area with stunning views of the lake and the surrounding mountains, only a few steps from the city centre and within very easy walking distance from public transport. The building was designed by Architect Rino Tami, refurbished retaining the typical features which inspired the artist himself. On the ground floor are a fitness room and a shared garden, as well as cellars and parking spaces. 5.5 room flat: Entrance hall, toilet, large living room with dining area and open-plan kitchen, storage room, two bedrooms, bathroom, master bedroom with en suite bathroom and walk in closet, two terraces and a balcony. Casa Solatia offers the benefits of enjoying the sunshine and the lake while living in the city, with one foot in the local modernism of Ticino of the mid 1900's.